Guests fly to the North Pole on FlyOver America's Christmas ride located at the Mall of America. The FlyOver America family attraction at Mall of America was transformed into a magical winter wonderland this holiday season in the Nickelodeon Universe. From now through Jan. 2, 2017, FlyOver America will take guests on a search with Santa Claus to help find missing elves during an exhilarating multimedia flight across America and up to the North Pole. The FlyOver America attraction is a flight simulation ride that takes guests on an aerial journey over some of America's most spectacular landscapes. Riders sit suspended with their legs dangling 10- to-25 feet above the ground in specialized ride vehicles. 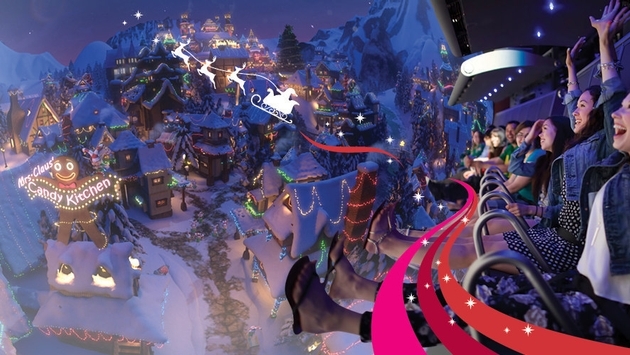 The feeling of flight is simulated with special effects such as scent, mist and wind, including the smell of Mrs. Claus' baking at the Gingerbread factory. In addition, the entrance to FlyOver America has been transformed into a winter wonderland and guests will also be able to send letters to Santa. As for the cost of admission, ticket prices for adults ages 13 and up are $16.95 and children ages 12 and under are $12.95. In order to ride FlyOver America, children must be at least 40 inches tall, and children eight and under must be accompanied by an adult or guardian. For more information on the winter makeover of the FlyOver America ride, check out the attraction’s official website.